Comorbidity describes someone who is struggling with a drug or alcohol addiction while suffering with a mental disorder. Mood disorders like depression and bipolar disorder are the most common types of comorbidity when it comes to substance addiction. Many drug and alcohol rehabilitation centers are prepared for this and offer therapy and medications to treat depression in addition to a client’s substance addiction. The question is whether depression led to the substance abuse or the substance abuse led to the depression. There are enough situations in which either could be possible. People who have been depressed for most of their lives may turn to drugs or alcohol as a form of escape from the cruel world that they perceive themselves to be living in. Wine, the first form of alcohol, was actually said to be discovered this way. The story states that a Persian princess in the ancient world attempted to poison herself with spoiled grapes to commit suicide, but to her unexpected relief, those rotten grapes lifted her from her deep depression. This was shared with the king and wine was born. 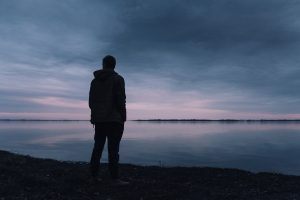 People who have been struggling with an addiction for years and can find little relief between the anhedonia they feel while on drugs and the withdrawal symptoms they experience when they try to quit are far more likely to become depressed. They may have already tried drug intervention programs, but with little luck. Their depression stems from a feeling that the future is hopeless. If you have no hope, then you lose the will to live. The other possibility is a chemical imbalance. However, not everyone is in complete agreement that chemical imbalances are a sole cause of depression. Most of you probably already know that depression means that someone is sad for the majority of the day for a period of several weeks, but this is the short version that excludes a few other components that are involved in the official diagnosis of major depressive disorder or clinical depression. When someone is struggling with major depressive disorder, this means that their mood is so low that their thoughts, behaviors, and performance at school or work are impaired. You may have depression if you experience a loss of interest in activities that once excited you, anxiety, angry outbursts, slower body movements, low energy, fatigue, guilt, and if any of these are negatively affecting you at school, work, or when socializing. Antidepressants are medications prescribed by doctors and psychiatrists to patients who display strong signs of clinical depression for over two weeks. Examples of antidepressants includes selective serotonin reuptake inhibitors (SSRIs), serotonin and norepinephrine reuptake inhibitors (SNRIs), atypical antidepressants, tricyclic antidepressants, and monoamine oxidase inhibitors (MAOIs). The reason there are so many of these medications is because not every antidepressant works for everyone and people often have to try different types until they find the one that works for them. Antidepressants work as effective agonists that block reuptake sites on neurons to prevent certain neurotransmitters that make you feel happy from going back up the neuron they came from. Since these neurotransmitters cannot return to where they came from, they accumulate in the synapse and their effects last longer. For example, SSRIs block the reuptake or serotonin. Serotonin builds up in the synapse and continues to exert effects on the postsynaptic neuron, which relays messages associated with happiness to the rest of the brain. Drug and alcohol rehabilitation centers primarily use antidepressants for people who are moving through detox treatment for stimulant addiction. People can become addicted to stimulants like cocaine, meth, and nicotine. When someone tries to stop using any of these substances, that person will experience many similar symptoms to depression, including full-blown depression that comes with extreme fatigue. Since there are no medications that can currently reduce the other withdrawal symptoms of stimulant dependence, many health professionals turn to using antidepressants to at least alleviate the patient from depression and low energy. Antidepressants are also given to patients who are dealing with comorbidity. Depression on top of trying to overcome withdrawal symptoms from alcohol, heroin, or prescription medication abuse can make almost anyone give up on the recovery process. However, using antidepressants while someone is trying to overcome an alcohol addiction can be risky because of the possibility of relapse. Relapse is not entirely uncommon during the road to abstinence, especially for alcohol dependence. Someone who is maintaining abstinence in a drug intervention program while taking antidepressants may relapse on alcohol, which could lead to dangerous side effects. Those side effects come from mixing antidepressants with alcohol, which can worsen the symptoms of depression and increase your blood pressure, sedate you, or impair your thinking significantly. At the Recover, we understand that substance addiction can sometimes feel hopeless, especially if you have tried countless times in the past to break free from alcohol or drugs. Withdrawal symptoms alone can be painful enough to make quitting feel impossible, but the cravings that follow are so enticing that often you may not even want to quit. The important thing you should know is that letting others help you in your struggle towards abstinence can improve your chances of recovery. Drug and alcohol rehabilitation centers offer various therapies, medications that manage withdrawal symptoms, and social support programs that will work with you to help you succeed in treatment. The Recover is an unbiased substance abuse and mental health news provider that offers people information regarding different aspects of alcohol and drug addiction. We also provide the public with information about West Virginia centers for addiction treatment and recovery. If you have been struggling with an addiction to drugs or alcohol then please do not hesitate to call us by dialing (888) 510-3898 to speak to a treatment specialist who will be able to answer any questions you may have and who will help you find a drug intervention program that fits your current situation.